Note: Oval stern, carvel built. Engine built by Beckett & Co., Hamilton, ONT. Low-pressure condensing engine, 32 X 32", 87 hp. Michipicoten River, Pt. Brule, ONT. 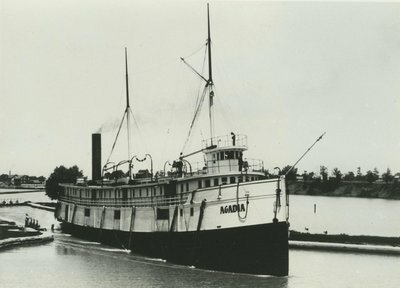 Registry closed at Hamilton on 1896, Dec 17, 1911 "Broken up"
1867, May Have been Great Lakes first composite vessel owned by J & G.T. Malcomson, Hamilton, ONT. 1868 Delivered oil & supplies to Canadian Lake Lighthouses, chartered by Dominion Government. 1871 Listed as having iron frames. 1877 Readmeasured 135.8 X 24.6 X 7.0, 372.39 gross/217 net tons. 1877 Owned by Eliz. Malcomson, Hamilton. 1878 Owned by Margaret Sutherland, Hamilton. 1880 Owned by John W. & Donald G. Sutherland, St. Thomas. 1882 Rebuilt and lengthened, 176.6 x 25.6 x 10.4, 806.36 gross tons, 509 net tons. 1887, Apr 11 Rebuilt at the cost $7000. 1896 November 5 Stranded & broken up, Michipicoten River, Port Brule, ONT, Lake Superior.